WATER CAN ENTER YOUR HOME FROM MANY DIFFERENT AREAS. 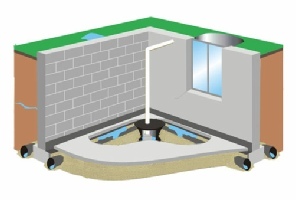 Although interior water drainage is not technically waterproofing, it is a widely accepted technique in mitigating basement water and is generally referred to as a basement waterproofing solution. Many interior drainage systems are patented as well as recognized by B.O.C.A (Building Officials and Code Administrators)as being effective in controlling basement water. They function by draining underground water from alongside the foundation footers and underneath the basement floor. They then channel it with a French drain, PVC pipe, to a sump pump system, which will then pump the water from the basement. Wall membranes are fastened to the foundation wall and extend over the new drainage to guide any moisture down into the system. 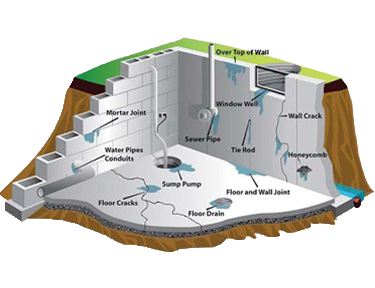 Water enters the home via the basement wall/floor joint, through cracks in the foundation walls and/or holes created by faulty or decaying masonry/brick. A perimeter trench drain such as a French drain collects the water before it enters into the basement. Wall vapor barriers/retarders and drip moldings are used and incorporated into the sub-slab perimeter drain to collect water coming from wall cracks and other foundation wall defects, such as pipe protrusions. The drain directs the water to a sump pump. The sump pump directs the water out of the house. Interior basement waterproofing systems should be prepared to work in the case of a power outage, the failure of a sump pump, and in the face of overwhelming torrential rain. A proper sump pump, backup sump and/or battery backup sump pump should be installed in a large sump pit with an airtight lid for safety and to keep humidity from seeping through to the basement environment, where it can promote mold growth. This airtight practice will also reduce the possibility of dangerous radon gases for entering the living space. If you live in the Southern Ontario area call us today to schedule your free no obligation basement waterproofing estimate.